There are many ideas to teach each Creation Day. But, what about an activity to combine all seven? 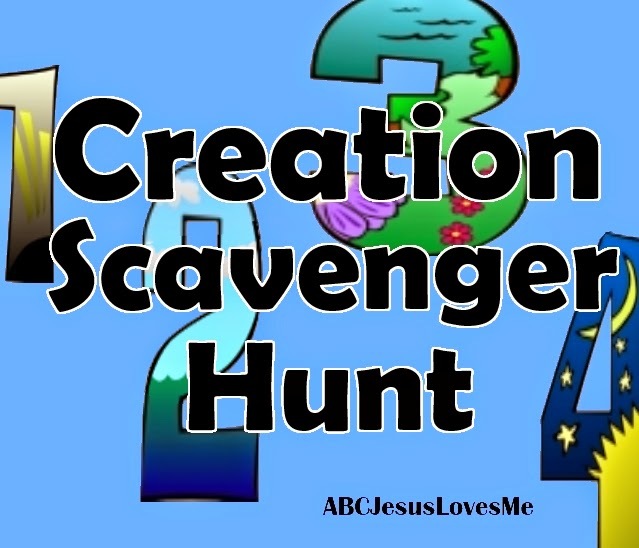 Jona shared on the ABC Jesus Loves Me Facebook Group a fabulous idea of a Creation Scavenger Hunt. I used the basic idea along with the snacks suggested in the ABCJLM Curriculum to create riddles for a scavenger hunt. Create seven baggies with the following snack food in a bag. Number each bag according to the day it represents. Hide the bags around the room or house. Grab a Bible and turn to Genesis 1. Then call the children together to explain the Creation Scavenger Hunt. For each day of creation, read a set of verses from Genesis 1 and 2. Then the child will be released to find a snack bag that represents each day of Creation. The child is to find the numbered bag and bring it to the table, laying the bags in order to review at the end. This activity could be done in a single day (hide each snack bag in a different area) or spread out over a week. We have a game to play. to help you find the snack of the Day. Read the following verses from Genesis 1. 1 In the beginning, God created the heavens and the earth. 2 The earth didn’t have any shape. And it was empty. Darkness was over the surface of the ocean. At that time, the ocean covered the earth. The Spirit of God was hovering over the waters. 6 God said, “Let there be a huge space between the waters. Let it separate water from water.” 7 And that’s exactly what happened. God made the huge space between the waters. He separated the water that was under the space from the water that was above it. 8 God called the huge space “sky.” There was evening, and there was morning. It was day two. 9 God said, “Let the water under the sky be gathered into one place. Let dry ground appear.” And that’s exactly what happened. 10 God called the dry ground “land.” He called the waters that were gathered together “oceans.” And God saw that it was good. 11 Then God said, “Let the land produce plants. Let them bear their own seeds. And let there be trees on the land that bear fruit with seeds in it. Let each kind of plant or tree have its own kind of seeds.” And that’s exactly what happened. 12 The land produced plants. Each kind of plant had its own kind of seeds. The land produced trees that bore fruit with seeds in it. Each kind of tree had its own kind of seeds. God saw that it was good. 13 And there was evening, and there was morning. It was day three. He always provides for our needs. Ask the child to create plants using the snack mix. Assist if needed. 14 God said, “Let there be lights in the huge space of the sky. Let them separate the day from the night. Let them serve as signs to mark off the seasons and the days and the years. 15 Let them serve as lights in the huge space of the sky to give light on the earth.” And that’s exactly what happened. 16 God made two great lights. He made the larger light to rule over the day. He made the smaller light to rule over the night. He also made the stars. 17 God put the lights in the huge space of the sky to give light on the earth. 18 He put them there to rule over the day and the night. He put them there to separate light from darkness. God saw that it was good. 19 And there was evening, and there was morning. It was day four. Ask the child to lay out and explain each snack piece. Assist if needed. 20 God said, “Let the waters be filled with living things. Let birds fly above the earth across the huge space of the sky.” 21 So God created the great creatures of the ocean. He created every living and moving thing that fills the waters. He created all kinds of them. He created every kind of bird that flies. And God saw that it was good. 23 There was evening, and there was morning. It was day five. 24 God said, “Let the land produce all kinds of living creatures. Let there be livestock, and creatures that move along the ground, and wild animals. Let there be all kinds of them.” And that’s exactly what happened. 25 God made all kinds of wild animals. He made all kinds of livestock. He made all kinds of creatures that move along the ground. And God saw that it was good. 27 So God created man in his own likeness. He created him in the likeness of God. He created them as male and female. 29 Then God said, “I am giving you every plant on the face of the whole earth that bears its own seeds. I am giving you every tree that has fruit with seeds in it. All of them will be given to you for food. 30 “I am giving every green plant to all of the land animals and the birds of the air for food. I am also giving the plants to all of the creatures that move on the ground. I am giving them to every living thing that breathes.” And that’s exactly what happened. Read the following verses from Genesis 2. Once all bags are found and laid on the table, review what each day is. End the Creation Scavenger Hunt in prayer, thanking God for His beautiful Creation. The riddles and Scavenger hunt is the copyright of JLM Media, LLC/ABCJesusLovesMe.com and may not be used under any other name.